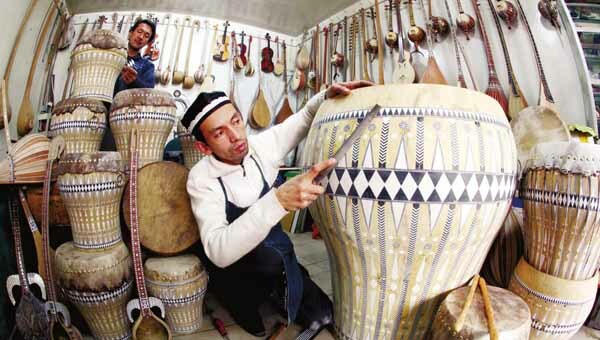 Overview: This 6 days' tour focuses the ethnic minority culture of Xinjiang Uyghurs on the Silk Road China with ethnic language, cultural cuisines and garb... living today like other Muslim minorities throughout Central Asia. Welcome to Xinjiang! Upon your arrival in Urumqi, your local guide will meet you at the airport and transfter you to visit Xinjiang Museum, Great International Bazaar. Then you will be transfered to Turpan to check in your hotel for overnight. Take a morning drive to the oasis town of Turpan Depression. Turpan depression is famous for its melons and vineyards. Here Marco Polo first encountered spaghetti, an idea he took home to Italy. Visit Jiaohe ruins and old Karez Wells in the afternoon. 2000-year old Karez Wells is a unique underground irrigation channel in Turpan, which, making use of the slopes of the land to direct water flow into underground channels to irrigate farmland. Places to visit: Gaocheng Ancient City, Flaming Mountain, Tuyuk Village, Astana-Karskhoja Tombs. After Turpan tour to visit Gaocheng Ancient City, Flaming Mountain, Tuyuk Village, Astana-Karskhoja Tombs, you will transfer back to Urumqi and take the evenning flight to Kashgar. Places to visit: Sunday Market, Id Kah Mosque, Kashgar Ole Town, Appak Hoja Tomb/Fragrant Concubine Tomb, Handicraft Street. Trip will start after breakfast. A mornign drive to Hotan. On the way, you will visit Yingsar Knife Workshops, Yarkand Golden Graveyard, Yarkand Ole Town. You will reach Hotan late in the aftrenoon. Places to visit: Hotan Sunday Market, White Jade River, White Jade Factory, Hotan Museum, Mulberry Paper Making. Trip will start after breakfast. After Hotan tour, you will take an evening flight to Urumqi for your next destination.